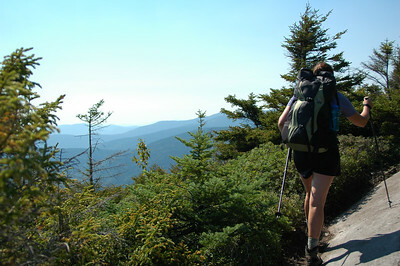 A three day hike through the most notorious stretch of the Appalachian Trail (AT). McKenzie closes the trunk at Altopia with Mt. 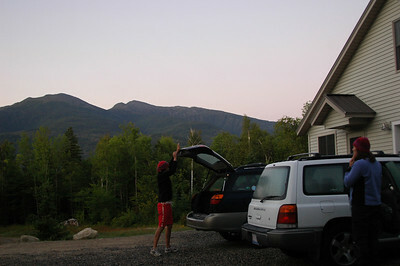 Adams in the background as we depart before sunrise for our Mahoosuc adventure. 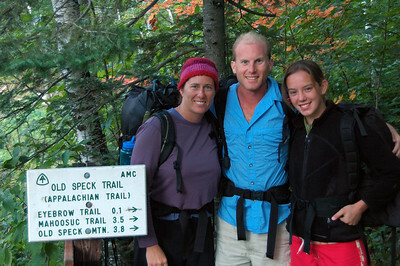 The Off Yonder Mahoosuc Crew (l. to r.): Dawn, Cameron and McKenzie. Photo by super support guy Al. 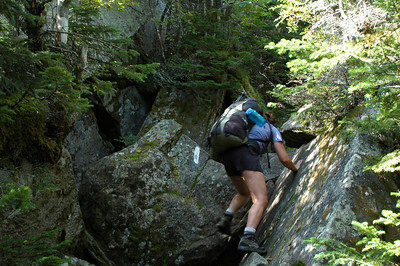 Starting at the north end in Grafton Notch. 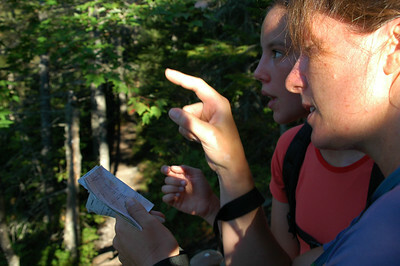 Part way up the Eyebrow on the trail up to Old Speck Mountain, Dawn and McKenzie practice their map reading and route finding skills. 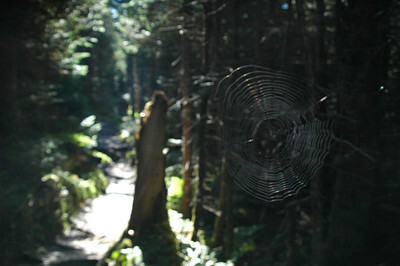 An elaborate web spans across the side trail up to the summit of Old Speck Mountain suggesting few have been up here recently. 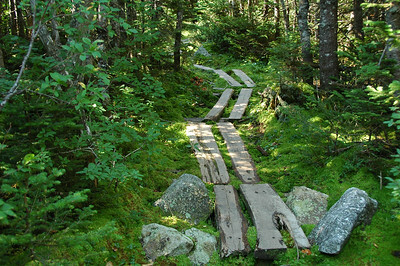 The familiar white blaze of the Appalachian Trail marks the way along this unique section of slanted slabby trail. 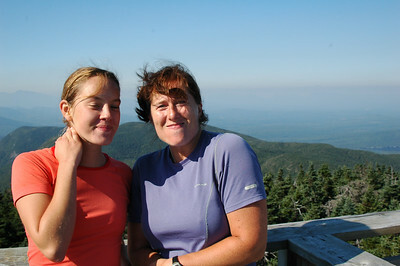 The girls atop the fire tower on Old Speck Mountain. They look like they're trying to keep from laughing while holding a mouthful of water, but really they're just clinching at the cool wind whipping by. 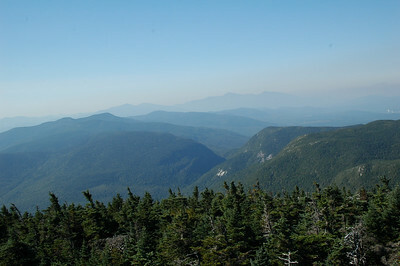 From the top of the tower, we can see Mahoosuc Notch, part of our hike for today. 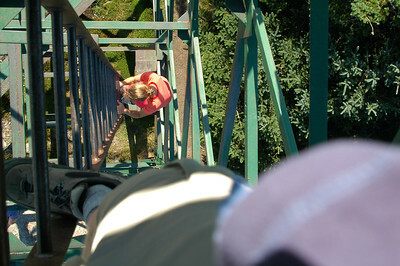 Looking down the ladder in the Old Speck Mountain fire tower. Bog bridges... meandering through the moss, showing us the way. 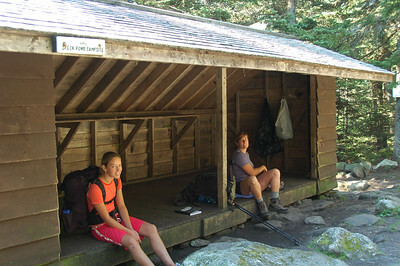 Our first major stop before lunch: Speck Pond Shelter. The girls look like they're happy to sit. 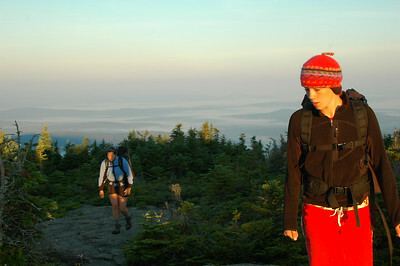 Dawn leads the way along the Mahoosuc Arm before we delve down into the Notch. 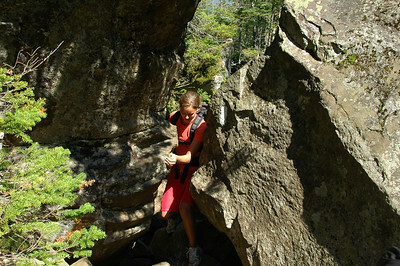 McKenzie looks down through one of the larger gaps between the rocks as we start our transect through Mahoosuc Notch. 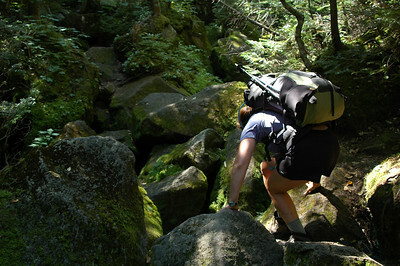 Dawn steadies herself as she works her way across and over the slippery moss covered rocks in the notch. 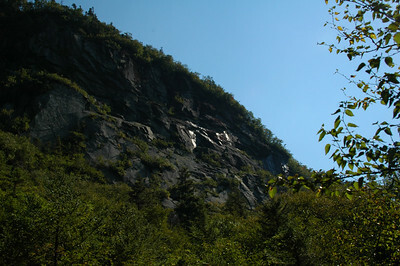 Finally we find an inviting slab of rock to picnic on for lunch. Every step is calculated in the Notch. 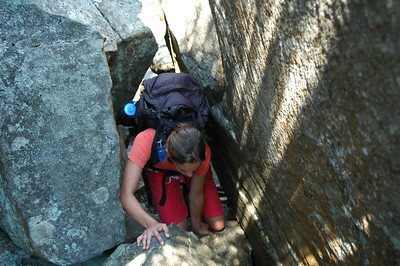 Cracks in the rock, trees to grab and a tested sense of balance all come into play. 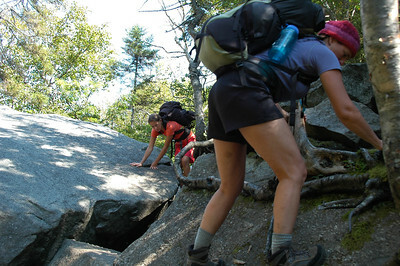 A strategically placed white blaze confirms we're still on the trail... otherwise it would be hard to know this narrow gap was part of a 2000+ mile trail from Georgia to Maine. McKenzie deliberates on how she's going to get through. 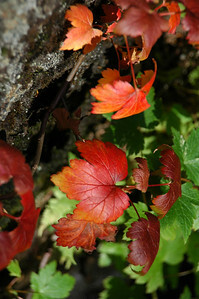 Fall colors are already starting to set in... even deep in the Notch. The walls tower steeply above us. 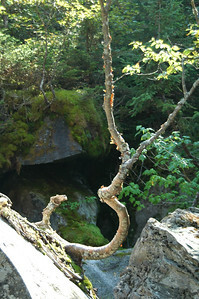 Dr. Seuss must have come through here and was either inspired or molded this tree to suit him. Dawn tries to figure where to place her hands to work her way up this narrow chimney. 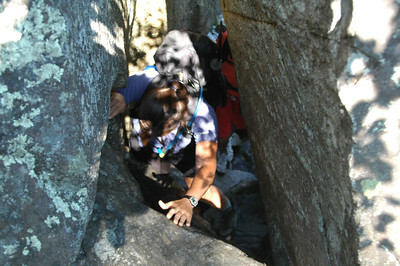 McKenzie reaches for a tree to help pull herself through this tight squeeze. 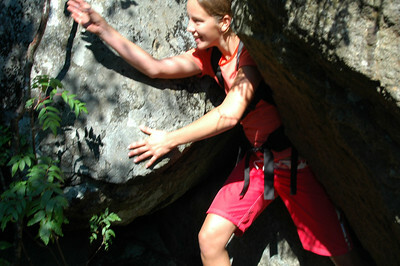 Another narrow hands-and-knees sort of passage. 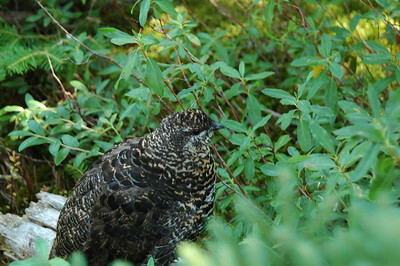 Once out of the Notch, this very docile grouse tries to distract us from the nest of chirping chicks in the thrash just off the trail. 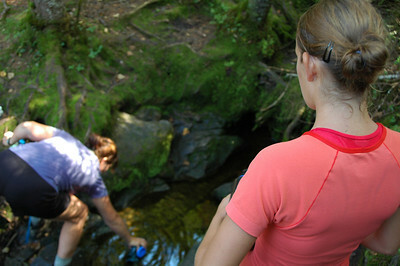 McKenzie waits her turn at the water hole at our first camp. 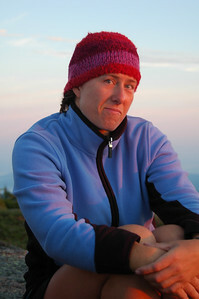 McKenzie gets some dry and warm clothes on while Dawn gets our pasta dinner going in the Full Goose Shelter. 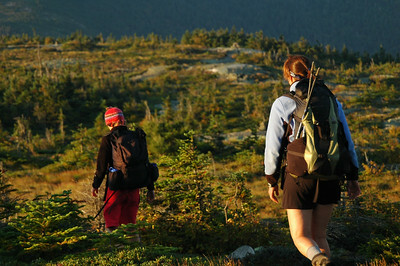 The next morning, an early rise gets us packing and moving in the dark (here McKenzie fills stuffs her pack) as we attempt to get to a vista point for a warm breakfast with the sunrise. 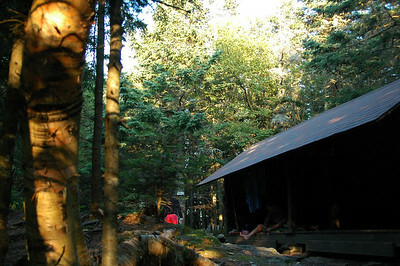 The golden evening light trickles through the trees, but little of it still reaches our shelter. A solid pasta dinner, and mmmmm, warm pasta juice, cap of a perfect day and knocks us out cold. The un-risen sun rings our view with a glowing band on the horizon announcing its eminent rise. Once at the top, it's a little windy, and quite frankly, cold! McKenzie is happy to get her jacket and cap on. 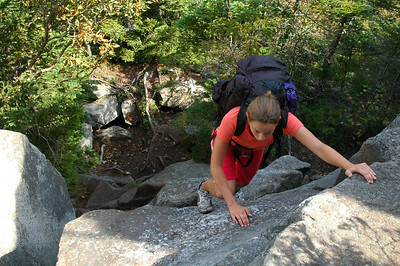 Nothing like a solid climb in the morning before breakfast. 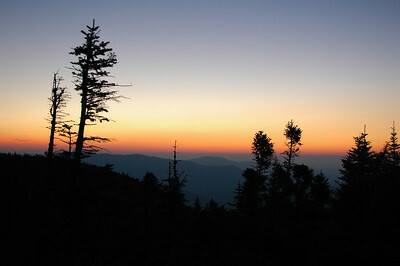 Eventually, there is enough light and we continue to climb the 700 feet in under a mile, now without our headlamps. As we're boiling our water for some hot cereal, the glowing globe of the sun pops up from the horizon and is barely able to penetrate through the widest part of the atmosphere. 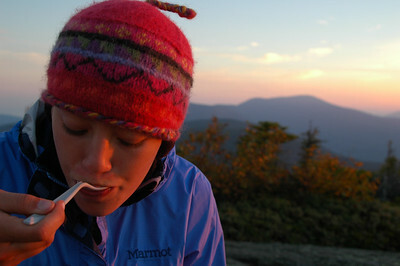 Dawn, who is not a fan of oatmeal... at all, enjoys her granola bar and the sunrise while bundled up. 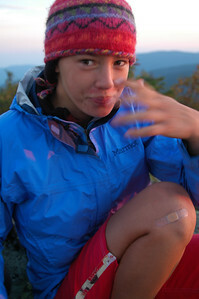 McKenzie shakes her hand in front of her mouth after taking a bite of oatmeal that was a bit too warm. Aww... just right. Now we just need three bears to amble by and claim it was their breakfast we ate. Moving again, a cool breeze keeps us bundled up. Check out the fog still filling the valleys below. 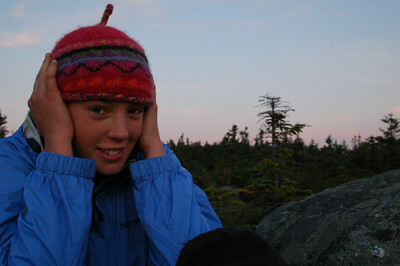 Kenzie sheds her fuzzy layer after a climb up to and on North Peak. Dawn is ready to roll. 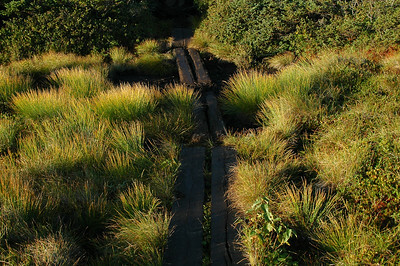 More bog bridges, now amongst the tufts of grass in the long morning light. Not an uncommon view as we continue in the fragile Alpine Zone ecology. 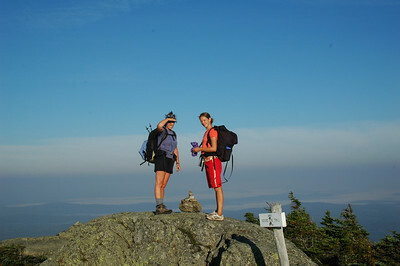 Atop Goose Eye Mountain. 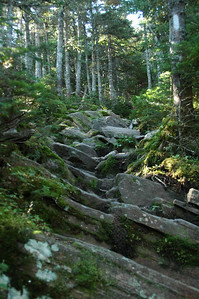 Now, back to the main trail, which will become a very steep climb down. The wind continues to whip by as we stop for a water break on an unnamed knob giving us a good view of our next summit: Goose Eye Mountain. 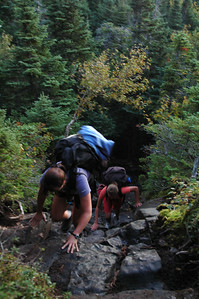 Yes, the trail drops off as abruptly as it seems into a small pass before we climb back up Mt. Carlo seen in the distance. Over and beyond Mt. Carlo, we drop down into Carlo Col where there is a shelter and a water hole. No, we're not stopping here. It's not even lunch time yet! Getting out of the Col puts skills acquired in Mahoosuc Notch to use. 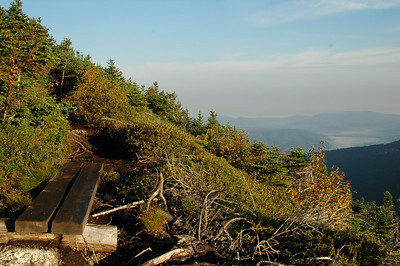 The white blaze reminds us we're on the right trail... in case we were wondering. Rt. 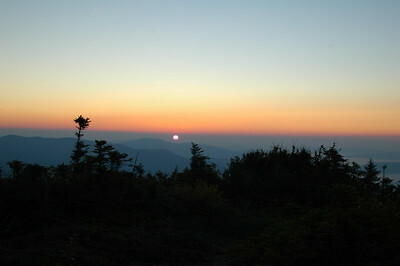 2 is where we're going, tomorrow; Springer Mtn. 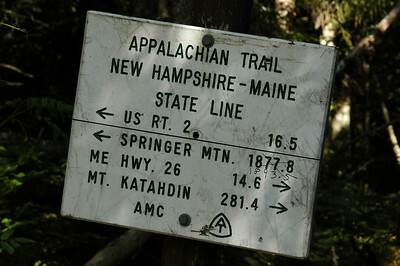 is the start of the Appalachian Trail in Georgia; Hwy 26 is where we started yesterday; and Mt. 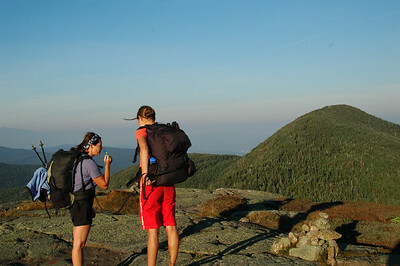 Katahdin is the north end of the AT. Looks like someone coming up from Georgia counted a few more steps than the person who made this sign. 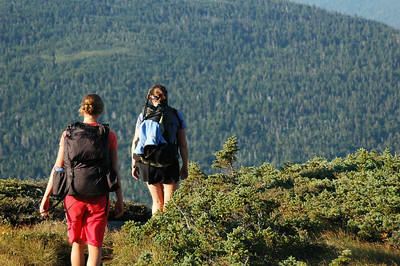 It's moments like these we're really glad we have little packs.